Vitamin C Crystals is a natural supplement in the form of Calcium Ascorbate crystals which can be added to water or stirred into soft drinks. It is a convenient way to take this important vitamin as part of a healthy diet and overall health maintenance. The body does not manufacture vitamin C on its own, nor does it store it. It is therefore important to include plenty of vitamin C-containing foods in your daily diet or as a supplement for guaranteed, measurable, dosage. Bio Health products are totally additive-free supplements of medicinal quality and are totally free also from ingredients that have been genetically modified. `PURE-FIL` products have NO artificial colours or flavours, synthetic preservatives, chemical excipients, binders, fillers or coatings and no added starch, sugar, salt, lactose or gluten. Take 1g (approx. 1/4 of a teaspoon) daily dissolved in water or stirred into a soft drink of your choice. 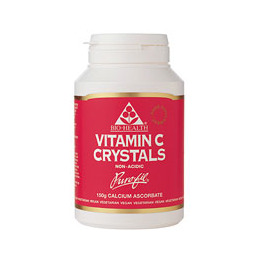 Below are reviews of Vitamin C Crystals - 150g Crystals by bodykind customers. If you have tried this product we'd love to hear what you think so please leave a review.